Made in the USA… Tested & Proven! Replacement Ultraviolet (UVC) lamps for germicidal treatment and total organic carbon removal – including standard output, high output (HO), and amalgam technologies. Keeping your lamps protected! Quality, American made type 214 fused open ended or domed replacement quartz sleeves available in various lengths and diameters. From Aquafine to Zed…UV Superstore offers an array of replacement parts for ultraviolet water and air treatment systems including current models and obsolete designs. No need to worry about your household water quality…Our residential water treatment systems will give you peace of mind. These systems are economical and require very little maintenance. 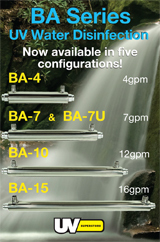 Wide selection of innovative ultraviolet water treatment systems! UV technology for disinfection, ozone destruction and TOC reduction has been used in commercial and industrial applications for over 50 years. Go Green! Ultraviolet light for wastewater disinfection is the environmentally-friendly alternative to chlorine disinfection. Our experienced sales team will meet your specific requirements and assist with your conversion. Don't let your profits get tanked…By using this system, the air is disinfected with germicidal ultraviolet light providing a 99.9% reduction in living organisms. The choice is yours…Not only do we sell used and reconditioned ultraviolet systems; we can rebuild your UV system to near new quality. 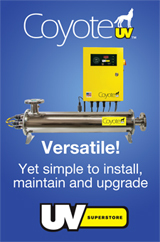 Thinking of upgrading your UV system…Save time and money with our retrofit kit solutions for several OEM UV systems.